Strictly a concept for now, but a production version is inevitable. As , Kia has officially pulled the sheets off its latest concept, the Niro EV at CES. 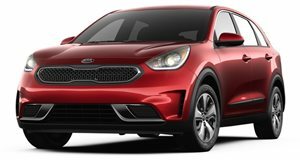 Although it’s a concept for now, Kia claims the Niro EV is capable of a 238-mile range on a single charge, and can be recharged up to 115 miles in only 30 minutes. To give you a better idea just how impressive those figures are, the Nero EV concept’s range is better than that of a base Tesla Model 3. The Model 3, of course, will underpin the upcoming Model Y crossover, undoubtedly one of the Niro EV’s prime targets. That impressive range is provided by a 64 kWh battery pack that powers a 150 kW electric motor for a total of 201 hp. Another quick comparison: the Chevrolet Bolt has 200 hp and identical range. Compared to the Niro gasoline and plug-in hybrid versions already on sale, the EV concept differs stylistically with a new screen in place of the front grille. This screen, according to Kia, “is an interactive display panel combined with ultra-slim lamp technology in the overall front.” Like other EVs, the Niro EV runs silent, which isn’t a good thing for pedestrians. To combat this, Kia has equipped the car with its clever Active Pedestrian Warning System (APWS). This features a front combination of front view cameras, object recognition technology and front speakers. If the system detects a pedestrian or cyclist crossing in front of the car, the speakers sound an alert targeted specifically at that person, warning them of the car’s presence. APWS is matched by the Niro EV Concept’s new interactive lighting system, which offers users and pedestrians a highly-intuitive visual communication with the vehicle. 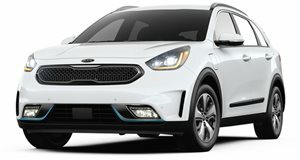 In addition to the Niro EV, Kia clarified its plans to launch 16 electrified vehicles by 2025, five of which will be hybrids, another five plug-in hybrids, and one fuel-cell EV. The latter is due in 2020. The automaker also displayed some concept interiors showing how occupants can interact with the car with things like facial and voice recognition, touch and hand gestures. Also interesting is what Kia calls dual-zone audio, which utilizes speakers in headrests combined with active noise-cancelling to allow front-seat and rear-seat passengers to listen to different things simultaneously without bothering others or needing the use of headphones.